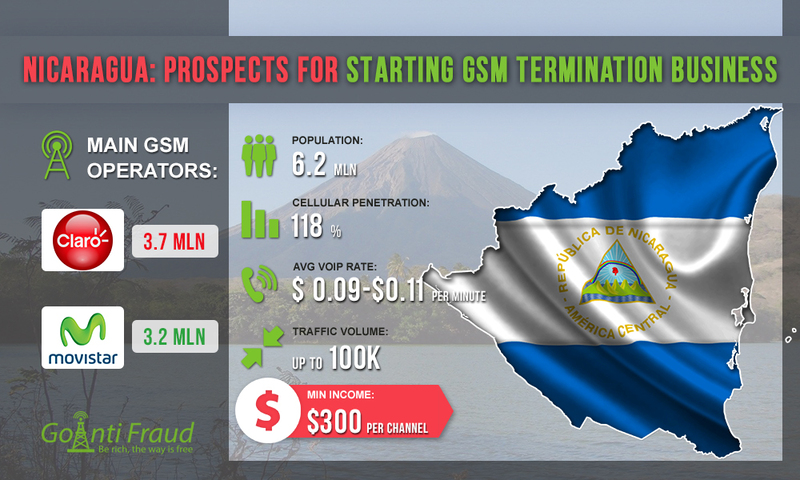 As a Latin American country with an average rate of $0.09- $0.11 per minute, Nicaragua can become a promising direction for terminating international VoIP traffic. The mobile communications market is quite well developed as mobile penetration is 118% as of 2017. Nicaragua is the largest country in Central America but at the same time, it is the least populous. Nevertheless, it concentrates rather large amounts of international traffic. Companies-originators offer up to 100 thousand minutes for the final termination in Nicaragua. Recently, the country's economy is growing as well as the telecommunications market, including the mobile communications sector, is developing. The cellular services market leader is America Movil, operating in Nicaragua under the Claro brand, with Movistar (Telefonica) competing actively. In fact, there is a duopoly in the mobile sector. Claro's subscriber base has more than 3.7 million subscribers, while about 3.2 million people use Movistar. In Nicaragua, a SIM-card costs over 40 cents. You can buy SIM-cards in kiosks, supermarkets, and from street vendors. If you connect prepaid tariff plans, the minute of a local call in Nicaragua will cost you about $0.02. When you have your GoIP GSM VoIP gateway operating for 2-3 hours a day, you can earn about $300 via each channel.